If one is wearing a brown leather belt and brown leather shoes, it is best to wear a watch with a brown leather strap. If one goes to shake hands and exposes a watch that completely clashes with the rest of the dress suit, the recipient of the hand shake may think “Does this guy know how to match his clothes properly? If the suit is black, most likely, the wearer will be wearing a black leather belt and black shoes, so it only makes sense to also wear a watch with a black leather strap. The most acceptable and safe answer to this question would be to suggest wearing a luxury watch with a gold case and leather strap. Something like a Patek Philippe Calatrava would be the perfect dress watch because it has an 18kt yellow gold case and a black leather strap. However, it is becoming more and more acceptable to wear a luxury stainless steel watch, such as a Rolex Submariner. However, the safest and most widely accepted answer would certainly be a gold watch with a leather strap. It goes without saying that watches with a rubber strap are not acceptable to wear with a dress suit. While they are perfect for a day of diving or other strenuous activity, rubber watch straps are not made to wear with a suit. Men’s dress watches are not typically a large, oversized watch. Their size is understated, serving as a complement to the finely tailored suit, rather than jumping out and demanding to be the focal point of the ensemble. It needs to be slim enough to be able to slip beneath the cuff of the wearer’s dress shirt. Although everyone’s preferences are different, most watch enthusiasts will agree that a dress watch is 42mm in diameter and smaller. For all of you visual learners out there, we have compiled a list of dress watches that we think would go perfectly with any formal suit. 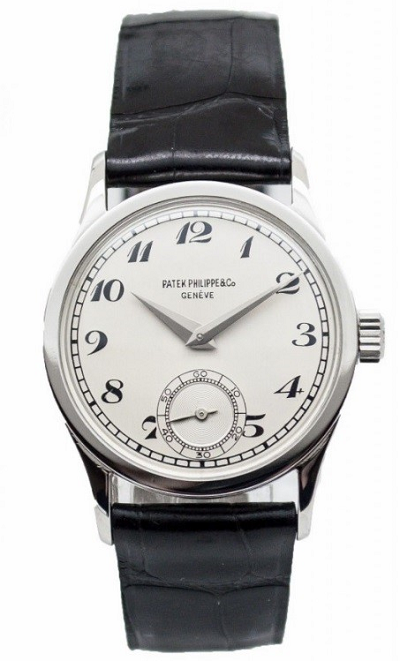 This Patek Philippe Calatrava 96 is the ultimate dress watch. With his clean lines, elegant design, and simple dial, this watch will not distract the person with whom you are conversing. Its small diameter of 30.5mm allows it to easily slip beneath the sleeve of a dress watch. The brand “Cartier” is synonymous with luxury and elegance. This classic Cartier Tank Obus watch is a beautiful watch with an 18kt yellow gold square case. The Roman numeral hour indicators give the watch a classic look and the blue-steeled hands and crown finish off the elegant look. This watch is a perfect finishing touch to any tailored dress suit. Like the Cartier Tank, this Jaeger LeCoultre Reverso Duetto 250.5.86 has a square case that automatically gives it a streamlined and refined look that is perfect in a dress watch. This particular model is 18kt yellow gold with a brown leather bracelet. The sleek case allows it to easily slip beneath the cuff of a dress shirt. The art deco shape of the case gives a contemporary twist to an otherwise classic watch. The Jaeger LeCoultre Reverso is one of those watches that are most likely in every watch enthusiasts watch collection. No matter the outward appearance, if the watch is A. Lange & Sohne, one can rest assured that it will be of the highest quality and will be beautifully designed. This particular watch is the extremely popular rose gold and is just the right size of 36mm. It’s large date window makes it easy for the wearer to slightly pull up his shirt sleeve and quickly glance at the time. Wearing a brand such as A. Lange & Sohne will let others know that the wearer has achieved success and has great taste, but doesn’t have to flaunt it with anything too flashy. 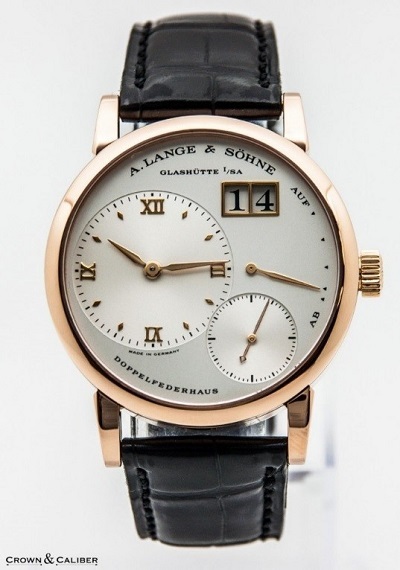 All of these characteristics make this A. Lange & Sohne Lange 1 111.032 the perfect dress watch to wear with a suit. When trying to look one’s best, a tailored, well-made suit is the very first step. But finishing off the look with a dress watch can truly complete the look. What is your favorite dress watch?